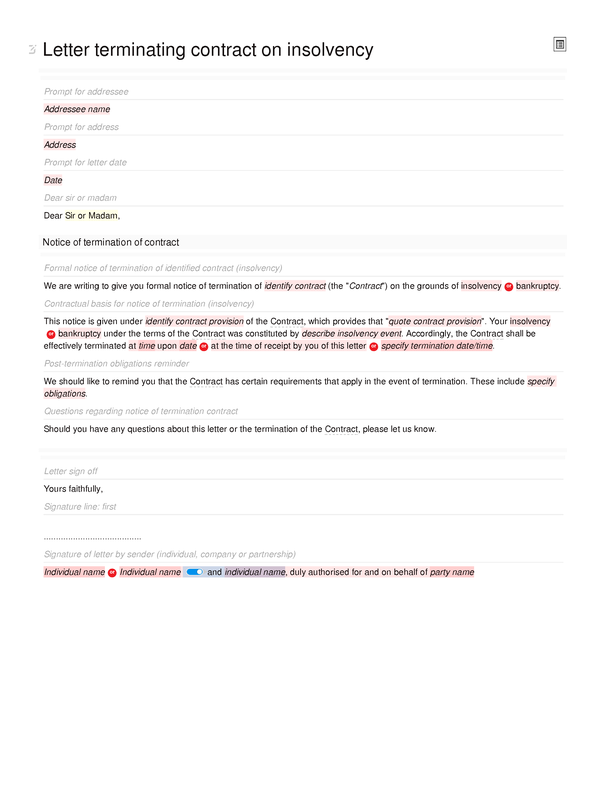 This letter template is designed to assist in the production of a letter terminating a contract, where an insolvency or bankruptcy event has given rise to the right of termination. It is very common for contracts to allow a party to terminate where the other party becomes insolvent or bankrupt. In some cases, a contract may be terminated where the other party merely threatens to become insolvent or bankrupt. In any case, you should review the relevant contract carefully when drafting a notice of termination. The termination or attempted termination of a contract may give rise to liability on the part of the party terminating or attempting to terminate. Accordingly, we recommend that you take legal advice before terminating or attempting to terminate a contract. Formal notice of termination of identified contract (insolvency); contractual basis for notice of termination (insolvency); post-termination obligations reminder; questions regarding notice of termination contract.